Want Cake? Make Banana Bread Instead! I love banana bread. I think it is an awesome use for bananas. I mean, it’s nicer than eating them plain, right? 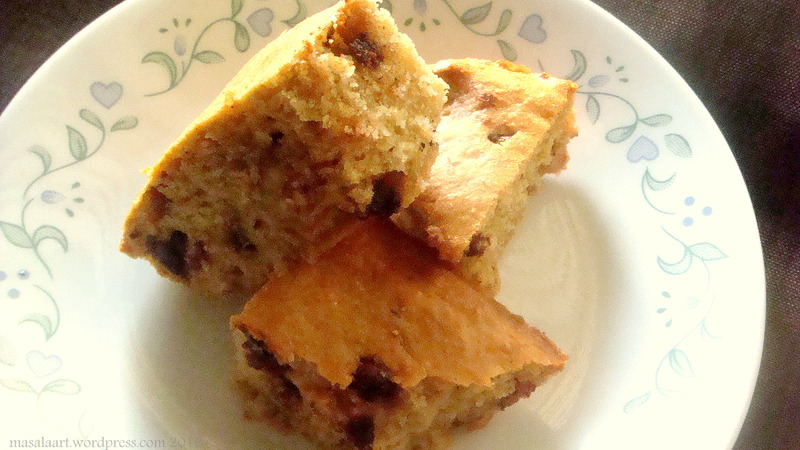 Technically, this is banana cake. It isn’t bread at all, since there is no yeast and no pulling of the dough. But because I have been referring to the above baked good as banana bread since age 5, and because my favourite bakery in my hometown makes something similar and also calls it banana bread, we shall refer to the above baked good as banana bread. And you know the best part about making banana bread? THERE IS NEVER A DEARTH OF BANANAS WHERE I LIVE, because we get bananas year round. That’s right. Bananas are right up there with coconuts. They are everywhere. Their pervasive presence is there for all to see on the roadside, at supermarkets, in lunchboxes. Benefits of living in the tropics. And I thought to myself: Why must I bust my a** trying to find lavender to make a lavender shortbread cookie, when I can buy bananas and make banana bread instead? (Well, looky there! A rhyme. I’m a poet and didn’t even know it.) 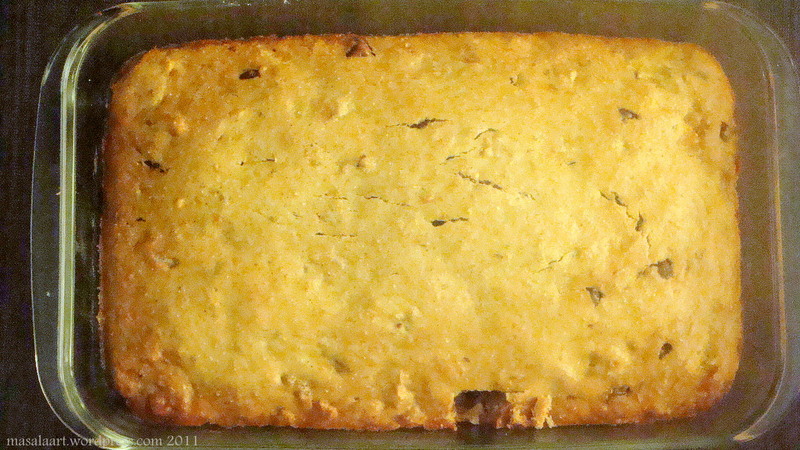 Not that procuring lavender is bad…it’s just that banana bread is also a perfectly agreeable sweet bake. You don’t need to whisk or use an electric mixer, only a spoon! First deal with your dry ingredients. 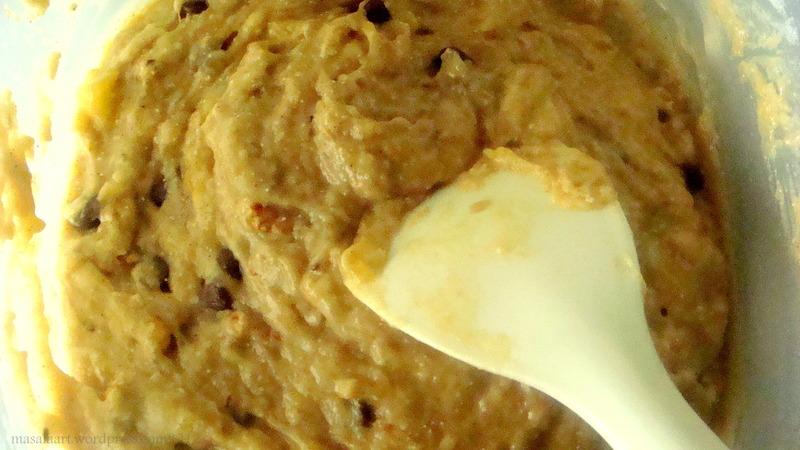 Combine walnuts, flour, semolina, sugar, baking powder, baking soda, cinnamon powder in a large bowl and set aside. In a separate bowl, combine the lightly beaten eggs, the melted butter, mashed bananas and vanilla extract. Stick it in the oven and bake for 50-60 minutes at 180 C, or until a toothpick or knife inserted comes out clean. I know this looks rather Dickensian, like little chunks of peasant bread, but believe me, it tastes great. I need to get a loaf pan to bake in. Moist banana, the crunch of walnuts, a slight grainy texture from the semolina and of course, the goodness of chocolate chips! Time well spent in the kitchen. « The Gourmet Cupcake Conundrum: To Consume, Or Not To Consume? Banana bread is one of the few things a novice (and lazy) baker like myself can handle. Love it! Looks delicious! Such a nice way to use up over ripe bananas , isn’t it?. Never tried it with semolia though. Love your version with choco chips.. Drool. this looks awesome, delecious way to use up bananas for sure! considering even im pathological abt chocolate chips in ANYTHING i would put it in too! Thanks Deeps! Banana bread is awesome even without chocolate chips…but adding chocolate chips just takes it to a different level of awesome. I can eat chocolate chips straight out of the bag. Looks wonderful! And, for sure, “mushiness” is a word. Hahaha! Thanks…the more mushiness, the merrier!